Vincent is a withdrawn, antisocial curmudgeon. He spends his days watching TV and/or drinking, playing the ponies and enjoying the talents of pregnant stripper/dancer Daka (Naomi Watts). His life changes when a moving van backs into a tree and a branch falls on his fence. 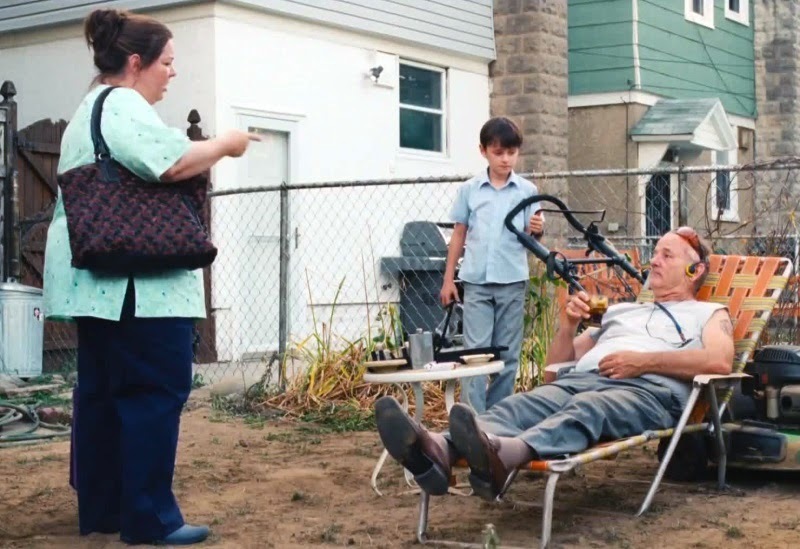 The incident is his introduction to his new neighbors – single mom, Maggie (Melissa McCarthy) and her son, Oliver (Jaeden Lieberher). To say he is unimpressed would be the most colossal of understatements – but Oliver, otherwise a shy and bullied kid in a new school and neighborhood, refuses to be cowed by the gruff neighbor. And Maggie, having no other choice, asks Vincent to help out with her son one night when she has to work late. The combination is, as Bogart might say, the beginning of a beautiful relationship. Before long, Vincent is teaching Oliver about life – including one lesson that helps him stand up to the school bully. His life lessons might involve mowing a dirt backyard, or playing the ponies, but in a weird way, they’re still good lessons. Oliver is smart enough to see them even if his mom doesn’t. As St. Vincent ambles along, we begin to see that there’s a lot of emotional stuff roiling under Vincent’s cranky bulk – laundry plays a huge part in our learning why. Oliver helps Vincent to face and deal with his real problems – as opposed to the surface ones that usually serve to deflect others away from him. He’s a very smart, perceptive kid. By the time the movie ends – in a way that makes the title surprisingly apt – we’ve bought into the situations and characters because they’ve been layered in amongst the laughs and we have come to really care about Vincent and his odd friendship with Oliver. Part of the reason we do – aside from the performances by Murray and Lieberher – is that there’s something about the Mutt & Jeff pairing of the very slight boy and Murray’s hulking presence that just seems to crystalize their opposite natures. McCarthy is probably going to be a revelation for her dramatic performance here. She is very, very real – and not a punchline in sight. Watching her as Maggie tries to cope with being a single mom with a latch-key kid is genuinely poignant – there’s no mugging, no playing to the audience. St. Vincent should silence critics who complain that she’s just a comedian. Lieberher, too, is superb as Oliver. His is a role that could easily have become precious, but he never strikes a false note. The easy way he progresses – especially once Oliver stands up for himself – is so true to life that kids of all ages will relate (and echoes a situation I personally witnessed back in high school). The relationship that develops between Vincent and Daka is also a nice revelation – and the source of both some genuine wit and equally genuine poignancy. Watts (who seems to be everywhere right now) combines Daka’s vulnerability and resolve in a way that impacts Vincent in unexpected ways. Writer/director Theodore Melfi achieves a delicate balance between comedy, wit and drama onscreen as well as on the page. 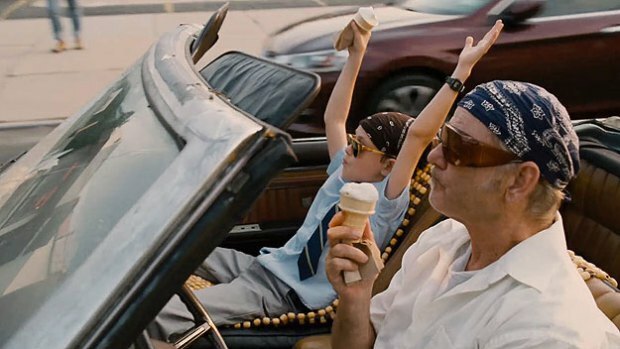 St. Vincent is yet another reaffirmation that a good story, no matter how seemingly familiar, can be made new with good material and the right cast to work with. Previous PostOuija: Spiffy Premise, Cookie Cutter Movie!Next PostJohn Wick: Well Worn Trope in a Fresh World!